I can’t tell you how many lemons have been squeezed and cakes made here in the name of research. 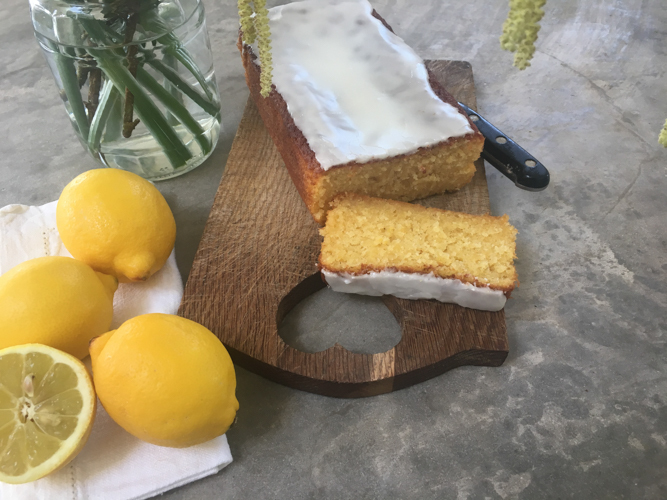 Lemon drizzles, lemon curds, lemon polentas and of course there is the layered beauty that features here in Lemon Cake and the 1970’s (May 2013) and often graces our table as our Easter Cake*. 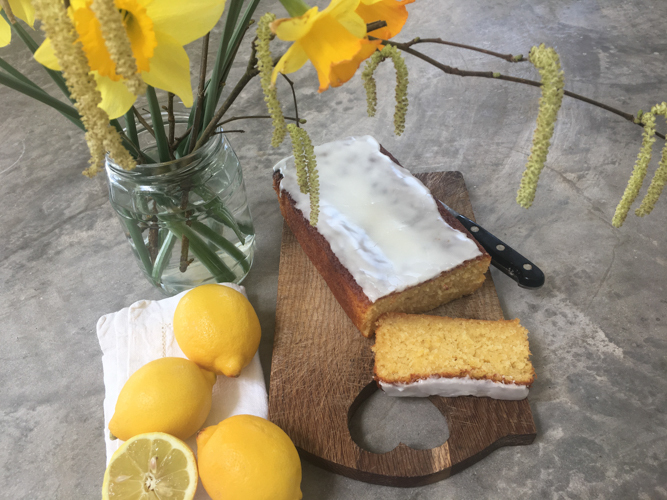 I’m happy to eat a lemon based cake any day of the year but in Spring it seems even more appropriate. That bright yellow zip and zest works perfectly when there is still a nip in the air but green shoots are on show and the hope of sunny days feels well founded. This then is a cake for teatime, picnics or rainy days, trips to the beach, eating outside or in front of the fire and, of course, for all those school bake sales. This modest looking little loaf cake has been tried and tested in many incarnations and this is my favourite. It couldn’t be easier, is very quick and a doddle if you have children who want to make a cake. If you don’t have any lemon curd don’t worry it will still be delicious but it’s worth having a jar of good curd in the fridge for such occasions. 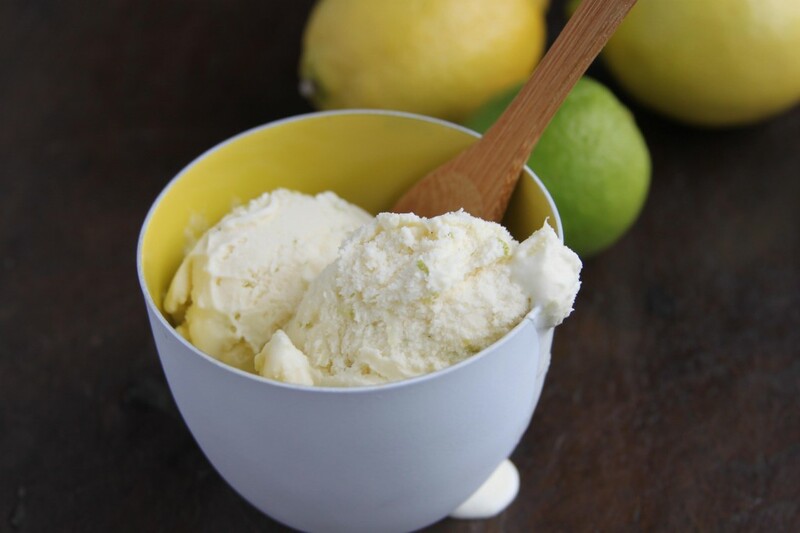 You can stick with a crunchy sugar and lemon drizzle if you prefer but this lemony icing is our perfect topping. Finally, whilst I am a huge fan of butter, it has become quite expensive and Stork or similar works brilliantly here – if its good enough for Mary Berry, its certainly good enough for me! Preheat the oven to 180 and line a loaf tin. Cream the butter or Stork and sugar together until light and fluffy, I use a stand mixer for this but a wooden spoon and bowl work a treat too. Add the eggs one at a time with a spoonful of flour until well incorporated and then add the remaining flour, salt, baking powder, zest and milk. Finally swirl in the lemon curd leaving a few streaks. Put the mix into the lined tin and bake for 40 minutes. Check after 30 and cover with foil if its brown on top before a skewer comes out clean. Whilst the cake is cooling, mix the icing sugar and lemon juice (add the juice slowly as you may not need it all) and then pour over the top of the cake. Leave to set and then tuck in. Well, here is a blast of summer. I’ve made no secret of my feeling that a weekend lunch isn’t complete without a pudding and we’ve tucked into no end of rib sticking treats appropriate to the colder months of the year. Golden syrup sponge, plum galette, apple crisp, raspberry larder pudding and a whole host of crumbles have made an appearance recently. Poking around in the freezer last weekend however I found a bag of blackcurrants which I’d picked last year and had been languishing in the icy depths since then. Whilst my surprise clearly illustrates that I am not one of those with a list detailing the exact contents of the freezer, the weight and when it was frozen etc – I was jolly pleased with my find. Thawed and simmered briefly with sugar I mixed them with cream and yogurt and we delighted in that mouth puckering, tangy, fragrant hit that is unmistakably blackcurrant. Should you have any berries in your freezer I highly recommend making this or simply buy a bag of frozen berries – I use them all the time in the winter for various recipes. Don’t worry if you have a few less (or more) blackcurrants – a fool is pretty forgiving and 20/30g either way won’t make much difference. Equally if you need to use a bit less cream or yogurt the end result will still be fruity and delicious. Simmer the blackcurrants for about 10 minutes with the sugar until the fruit has broken down and the juices have become syrupy, cool. 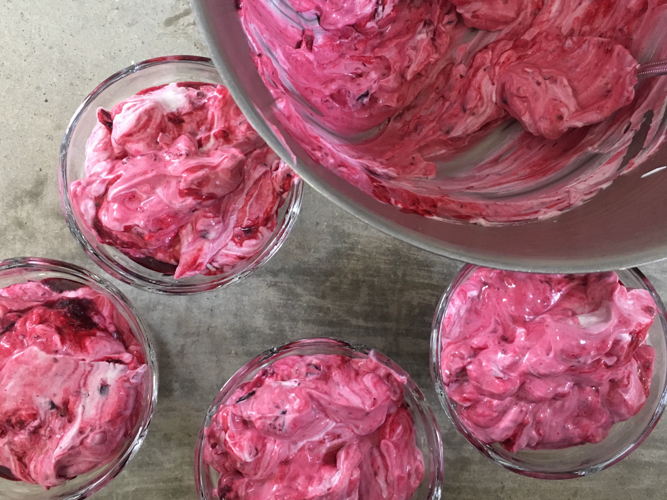 Whisk the cream until soft peaks hold, add the yogurt, mix again briefly and then swirl in the blackcurrants. Combine as much as you want – I like to seem some seams of pure blackcurrant but it is up to you. This served 4 with a bit left over for someones breakfast. 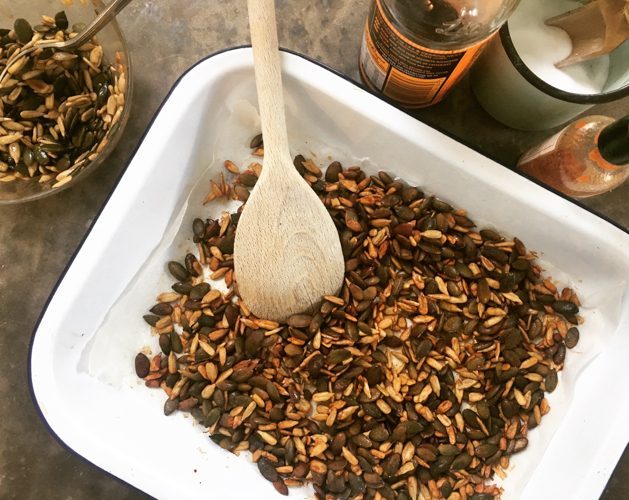 I am on a bit of a mission to increase our intake of pulses – they are cheap, filling and with a little magic can be quite delicious. I love them (now) but one of my children isn’t mad about them so inevitably I make it my mission to think of delicious ways to serve them up. To be fair I didn’t really like pulses much when younger and would pick them out of a cassoulet or chilli and line them up around my plate. It was always disappointing then to be asked to finish them, at this point cold and without anything more palatable to help them on their way. This is a delicious combo then, leeks and beans to please me and crispy skinned chicken to please us all. 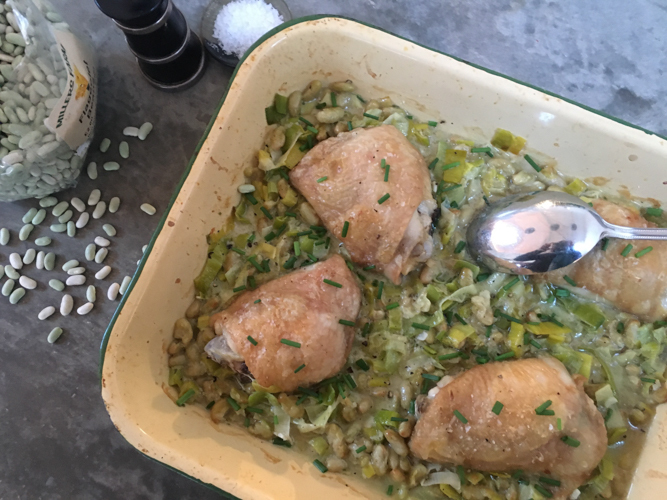 Don’t panic that four thighs aren’t enough, this is surprisingly filling and you can always serve another green veg or perhaps a crusty baguette and salad alongside. The leeks, flageolet and rosemary work particularly well together and this makes a great side dish to roast lamb. Pop it into an ovenproof dish, top with breadcrumbs and finish in the oven until crispy above and bubbling beneath. You can of course use dried flageolet, just remember to soak and cook them according to pack instructions prior to using them below. Heat the oven to 200, put half a tablespoon of the oil into a roasting tin, turn the chicken in the oil, season with salt and cook for half an hour. Heat the remaining oil in a large frying pan and cook the leek gently, without colouring, until soft. Add the garlic and rosemary, cook for a minute or two then add the beans, stock and cream. Simmer for about 10 minutes until a little reduced then check for seasoning. After its 30 minutes remove the chicken from the oven, add the leek mixture to the pan without getting sauce on the now crispy skin and return to the oven for a final 5-10 minutes until gently bubbling and gold skinned. Scatter over the chives or parsley if you are using them. Serves 4. Well this is a proper treat and even better supremely easy to make with only 5 ingredients! That combination of tangy apples bathed in caramel sauce with a crispy, flaky pastry base, just fabulous. 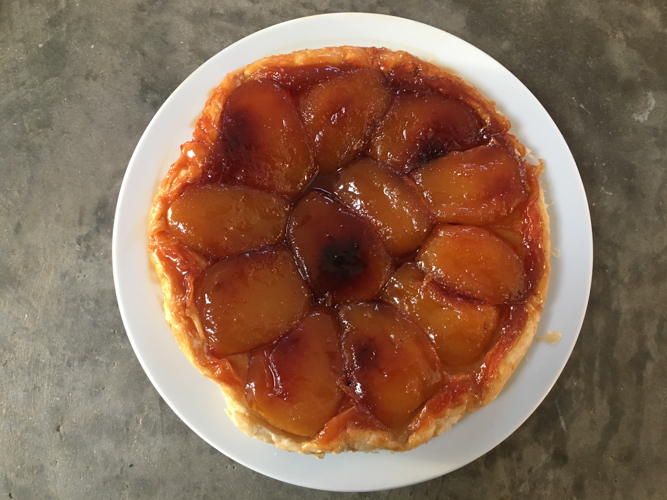 Whilst there are many recipes out there for Tarte Tatin, this one is so simple and delicious that I rarely deviate. It works like a dream and there is never any left over. By the way if you are a fan of salted caramel puddings just up the pinch of salt in the ingredients to about 1/2 a teaspoon and voila you will have Salted Caramel Tarte Tatin. A frying pan with an oven proof or removable handle is ideal but if you don’t have one just cook the apples in a regular frying pan and then transfer to a baking tin before topping with pastry and putting in the oven. I use a 20cm le creuset that I have had for ever and these amounts work a treat and we easily finish it between the four of us. I have also used a 30cm saute pan (also le creuset) which make a great big tarte but I did need a little help turning the pan over on to the waiting plate. I tend to use a pack of ready rolled puff pastry for this. With a bit of careful cutting out (and patching for the second) I can get two circles of pastry out of one roll so either make another tarte tatin, freeze it or make the Onion Tarte Tatin with Blue Cheese (February 2014)…. just saying. Preheat the oven to 200. Unroll the pastry and measure out a circle using the top of the pan. Melt the butter with the sugar and add the apples along with a pinch of salt. Cook for around 20-30 minutes until the apples are tender but not collapsing. As it bubbles a caramel will form. Turn the apples a couple of times for even cooking. Remove from the heat, ensure all the pieces are round side down then extremely carefully place the circle of pastry over the apples and tuck the edges between the side of the pan and the apples. Put in the oven for 20 minutes or until the pastry is golden and puffed up. Take the pan out remembering of course that the handle will be hot and let it sit for a couple of minutes to settle. Using a plate with a lip so you don’t lose all the sauce, invert this over the pan and quickly turn both so that the tarte ends up on the plate pastry side down, apple side up. Adjust any apples that have slipped out of place and serve with cream. I divide this into quarters for the four of us but reckon I could eat half without much trouble…. Tapas, mezze, picnic, however you refer to this style of eating I loved putting a load of different dishes on the table to pick at. Whether as lunch itself or simply a couple of things to whet the appetite before the main event. You will find many such recipes on these pages Cheese Gougeres (November 2016), Moutabal (February 2017), Artichoke Crostini (March 2013), Grissini with Rosemary (May 2015) are a few. More often than not the little plates I serve are vegetarian and it has often been a good way to entice my children to try something different. Rather than being faced with an entire supper of something new and unfamiliar – this is an opportunity for them to try something whilst knowing there is a myriad of old favourites to tuck into at the same time. I am a little ambivalent about feta. If it is mild I am happy to tuck in, enjoying its salty edge. Too strong or mature however and it ventures into that hirsute, goaty thing that I struggle with. In this recipe use whichever type of feta you prefer – you can even find feta style cheese now that only contains cow’s milk. This baked feta graced our table on Saturday evening amongst some other goodies. I served it with homemade little tortilla chips (don’t panic the chips are homemade not the tortillas – find the recipe in Girls’ Night In, February 2014) and this was the first empty plate, it literally disappeared before my eyes. Warm, soft, salty with a bite from the chilli – this could be one of the most moreish things I have eaten. Now this is a winning get out of jail free card if you need a last minute canapé or snack to go with drinks. The warm soft feta has a completely different character to the cool white chunks more familiarly seen in Greek salads. It takes on a delicate squidge that is enormously inviting and along with some chilli flakes and a sprinkling of herbs is the perfect mouthful to scoop onto a pita or tortilla chip. 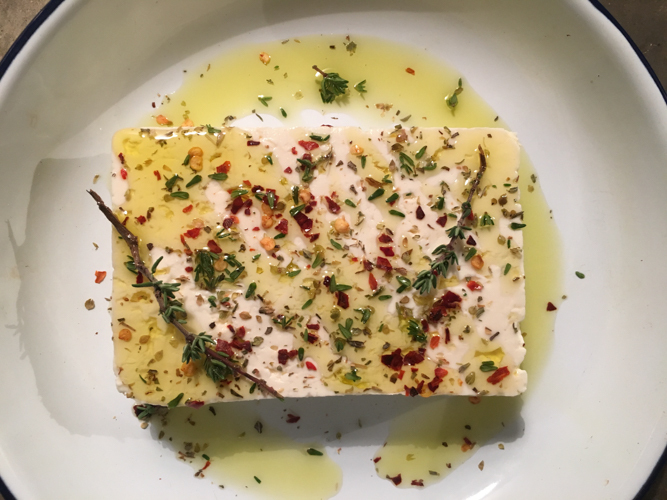 Packs of feta last for ages in the fridge and along with some hardy herbs you may have weathering the winter storms and chilli flakes in your cupboard you are all set. Sometimes I add olives to the dish before baking, it depends whether I have any to hand and its very good either way. The ingredients that follow are what I tend to have on hand and therefore what makes this a store cupboard saviour. You can use chopped fresh chilli if you prefer and even pickled chillis for a different but very delicious vibe. Preheat the oven to 200. 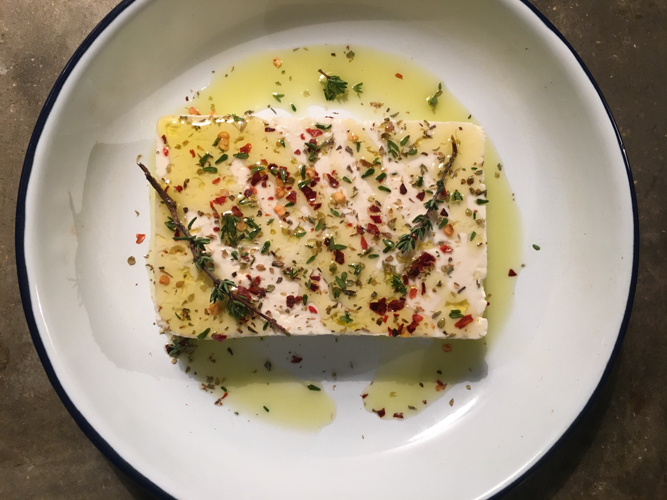 Put the feta in a small ovenproof dish, sprinkle over the chilli and thyme, drizzle with oil and add the olives if you are using them. Bake in the oven for 15-20 minutes until soft but not collapsing. Serve with homemade pita chips, tortilla chips or whatever you like. I made this recently to put out before lunch when friends came over and it was gone in minutes. Served with a garlicky courgette dip it was just the ticket with some pre lunch drinks and kept the children more than happy. As luck would have it this takes minutes to make and as such is something I regularly turn to. Although I love making all kinds of bread and make a loaf of white or sourdough weekly, this is a great one to have up your sleeve when the clock is ticking and there is no time for proving and rising. Whilst I might not have buttermilk in the fridge at all times, I always have yogurt to hand. This, let down with a bit of milk, works a treat in place of buttermilk and means a loaf of this moreish bread is never more than about half an hour away. 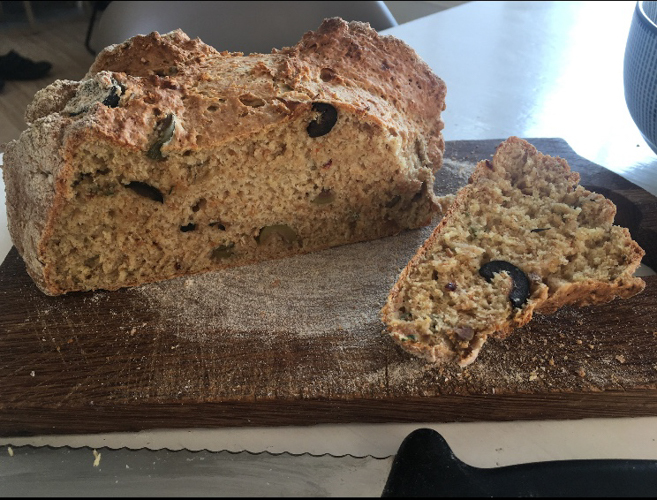 My daughter adores olives and chilli so can polish off half of this loaf without thinking and it takes the sting out of the veggie soup or salad that often accompanies it. Essentially a riff on my seedy soda bread, April 2013, I add some punchy flavours to this one. The chilli is up to you but I think it works a treat with the olives and thyme. There is a thyme plant outside the kitchen that manages to soldier on whatever the weather so along with some store cupboard olives this one is always a contender for lunch or supper. Or serve as I did at the weekend with a dip, a herby labneh perhaps or hummus and you will have happy faces all round. I make this with a mix of wholemeal and regular white flour but you can go with all white if you prefer or if that is what you have. Buttermilk sometimes comes in 284ml tubs for some reason so just make this up to 300ml with milk. If you are using yogurt, use 200ml and make it up to 300ml with milk. Preheat the oven to 200. Put the flours, salt, bicarb, sugar, olives, thyme and chilli in a large bowl and mix. Add the buttermilk and give it a good mix together. Sprinkle some wholemeal flour on a baking sheet, make the dough into a ball, put on the tin, sprinkle a little more flour over and cut a cross in the top with a sharp knife. Bake for 30-35 minutes until crusty, golden brown and sounds hollow when you tap the bottom. 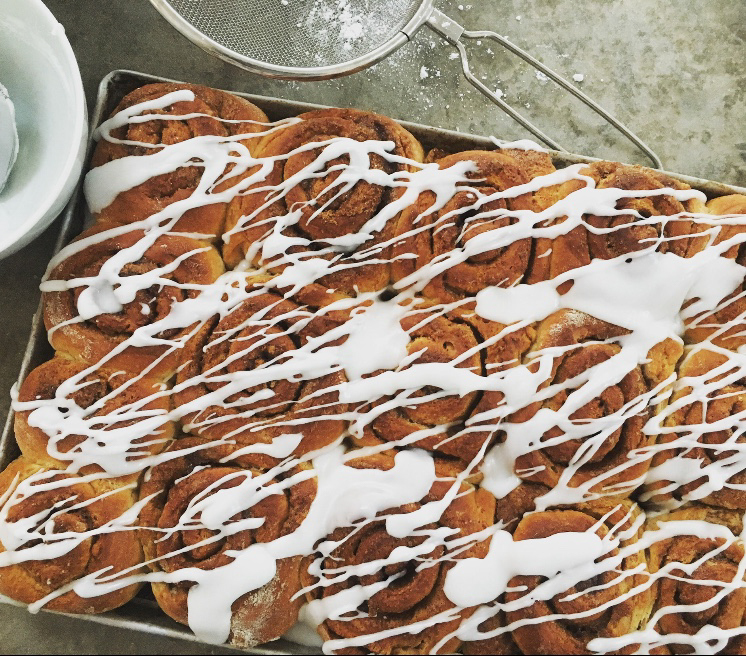 Sweet, squidgy, fragrant with spice – what’s not to love about a cinnamon bun? As yet I haven’t met anyone who doesn’t weaken at the knees with the mention of a CB. My children adore them and regularly make urgent requests for me to bake some. There is no great secret to making these, bread flour rather than plain gives that fluffy soft dough which is then wrapped around a buttery, sugary cinnamon filling. The final flourish of icing completes the picture and makes them pretty much perfection in our book. So, whilst these are super easy to make remember to allow a bit of time. Like other recipes using yeast it requires a couple of rises. I give myself about a 4 hour time frame (which includes cooling them if you are going to ice them) but there isn’t more than about 30 minutes of hands on time. Just letting you know in case you want to get them ready for the end of school…. I find a stand mixer easiest for this as it is quite a soft dough. Put the flour, yeast, salt, 60g sugar and cinnamon into the bowl of your stand mixer. Once mixing add the warm milk and beaten egg followed by the 75g soft butter, a bit at a time until it comes together then let this mix for 5 minutes. Leave to rise for an hour in a warm, draught free place. Roll the dough out on a floured surface until approximately the size of a tea towel then spread with the 100g soft butter. Mix the 80g soft brown sugar and 2 teaspoons cinnamon together and then sprinkle this evenly over the butter. Roll up from one of the long sides and then cut into even pieces about 2cm thick. Depending on the length of your roll you’ll get about 12-16. Place these cut side down and well spaced on a large baking sheet and leave to rise again for another hour. Just before the time is up preheat the oven to 190 and then bake for 25-30 minutes until puffed up and golden. Leave to cool. Sift the icing sugar into a bowl and mix with just enough water to get the consistency you are happy with before trickling it over the buns either neatly and artistically or rather more erratically as I have done in the photograph above. The chaos that is the summer holidays is upon me. As usual I find myself being cook, driver, entertainments manager and all round major-domo. 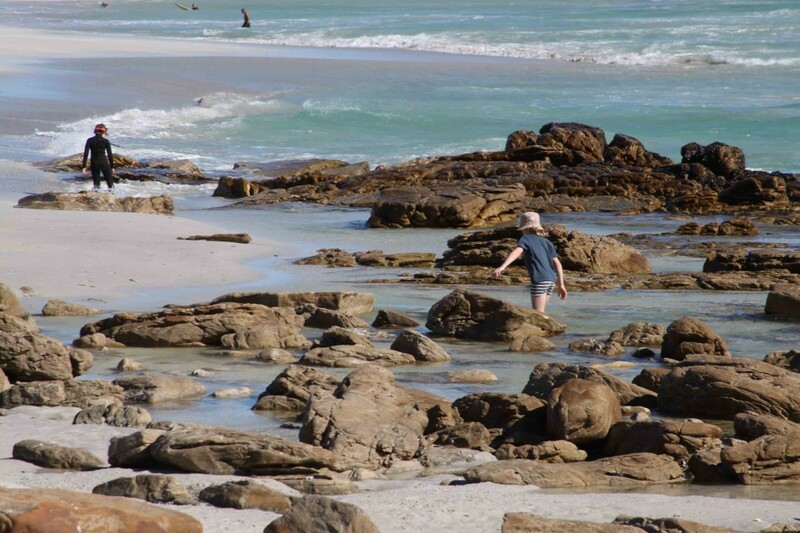 On the whole I relish this and particularly enjoy having my children at home (most of the time….) but efficiency which is not my foremost characteristic always needs cranking up. Unexpected and sometimes many mouths to feed is a frequent situation and it is at these times that I fall back on much used, reliable recipes. Ones I can do without any panic and which I know will go down a storm. Here then is a collection of such recipes that I will be turning to again and again. Need a quick cake – no problem, my ginger one always goes down well. 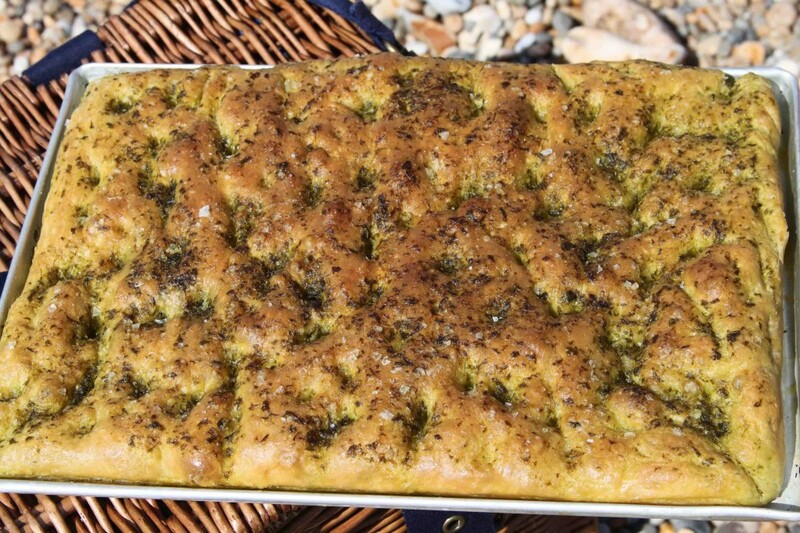 Need a contribution for a picnic, easy – no-one ever turns down this focaccia and something for lunch, well look no further….. 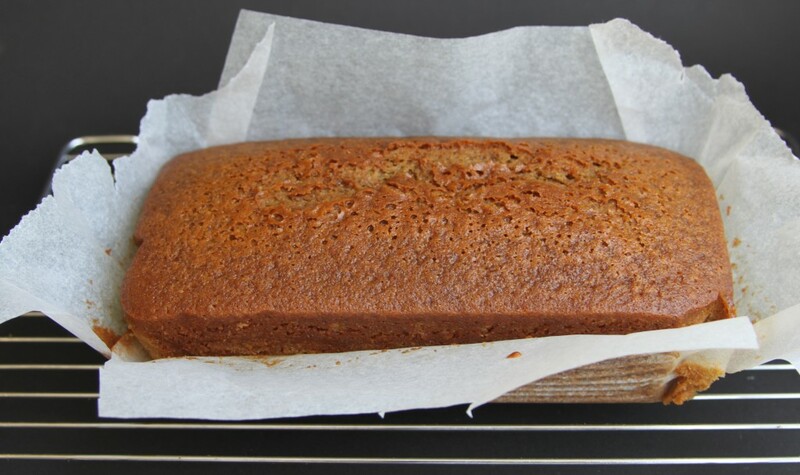 This Ginger Cake (July 2013) is super easy, you probably have most of the ingredients in your cupboard and is so good it never hangs around for long. I don’t think there is a picnic that I haven’t taken this Focaccia (May 2014) to. 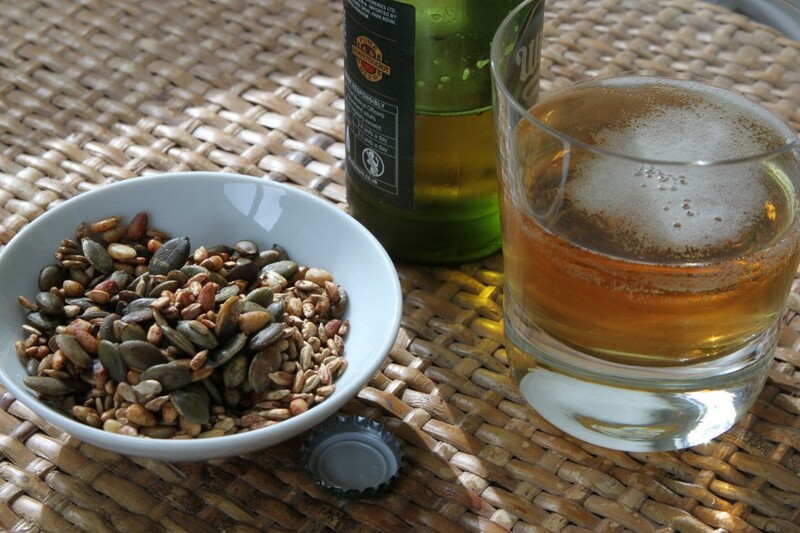 It also goes down well cut into little squares and served with drinks before lunch or dinner. Really easy and you can make the dough the night before and leave in the fridge ready to finish off in the morning if that suits. Once the wild garlic is over I often just sprinkle with crunchy sea salt or make use another herb to make the sauce. Whilst I adore a good old green salad (January 2014) and eat one several times a week, there are times when you need something a little more substantial and with a bit more going on. My Christmas salad (December 2013) gets endless outings and is the number one choice to go in soft white bap with pulled pork. 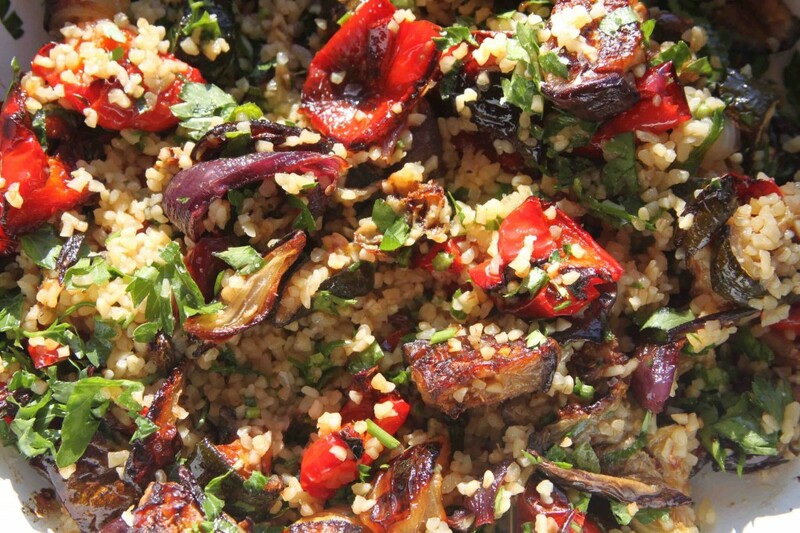 The Roasted Vegetables with Pomegranate Molasses (July 2014) dressing is another go-to and often gets wheeled out with barbecues. Puddings too feature a lot in my summer menus, all that fabulous fruit and also the time to spend around the table with just one more course…. 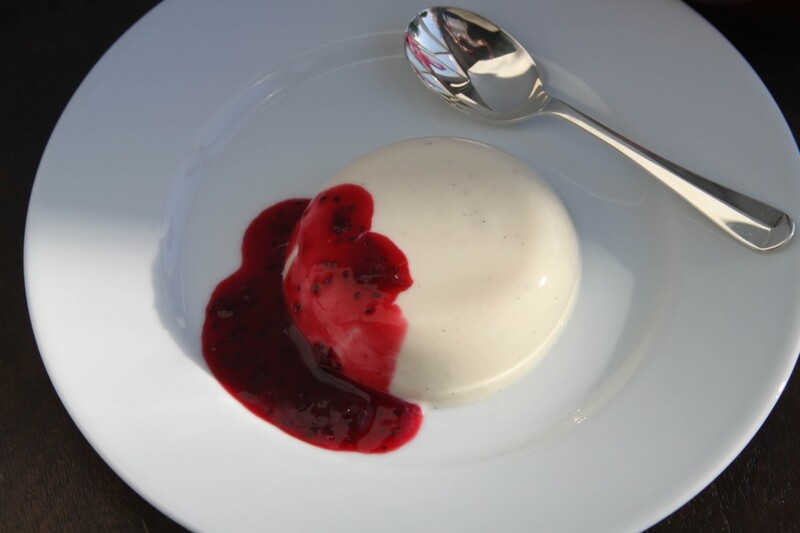 Maybe a Pannacotta with Blackcurrants or any other fresh berry sauce (July 2014) and how about a Lemon and Lime ice cream (May 2014). Oh and don’t forget that Elderflower and Apple Jelly I posted last month, the last word in easy and delicious. So, enjoy the holidays and I hope you try some of the recipes here, just trawl through the summer months of previous years and you will find the recipes that keep me sane. Funny how something so simple still draws the oohs and aahs when brought to the table and goes down equally well with children and grown ups. Quick to make, cheap and easily zhuzzed up with summer fruits this is real a star to have up your sleeve for entertaining as the warm weather arrives particularly as it has to be made ahead to time. 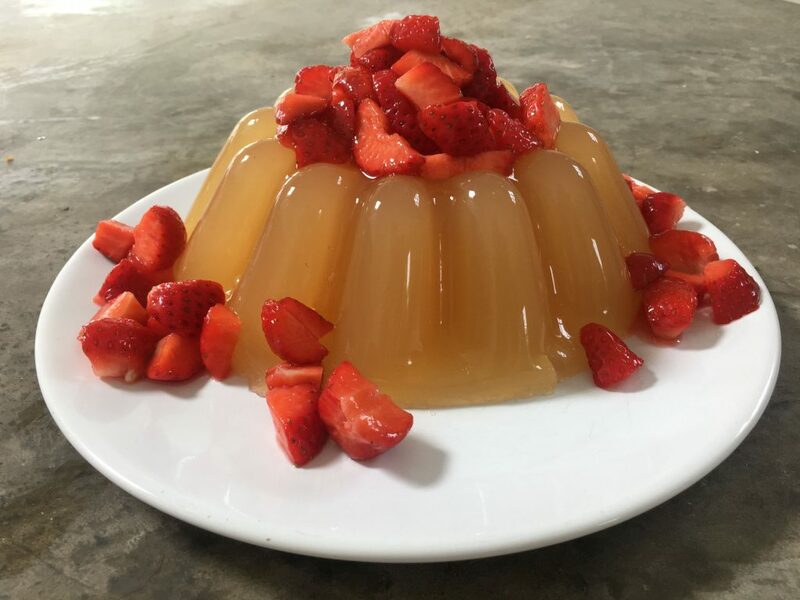 I often try new flavour ideas for jelly – it is after all simply a liquid and the requisite amount of gelatine – and this is our current favourite. I’ve made this twice over half term and both times have been left with an empty plate. On the first occasion I served it with rhubarb fool, rhubarb and elderflower being extremely good friends; the second time with a few strawberries on top which had macerated for half an hour in a spoonful of sugar (as in the pictures here). When the weather really warms up you can dispense with the gelatine and pour the apple/elderflower mix direct into ice lollies moulds for super refreshing ice pops. I choose to use apple juice and add elderflower cordial as that way I get the balance of flavour I like but you could probably use a combined apple and elderflower juice if you prefer. There is a recipe for elderflower cordial here, (June 2016). Put approximately 300ml of apple juice in a pan and heat gently but don’t let it boil. Put the rest into a jug and mix with the elderflower cordial. Meanwhile soak the gelatine in a bowl of cold water. 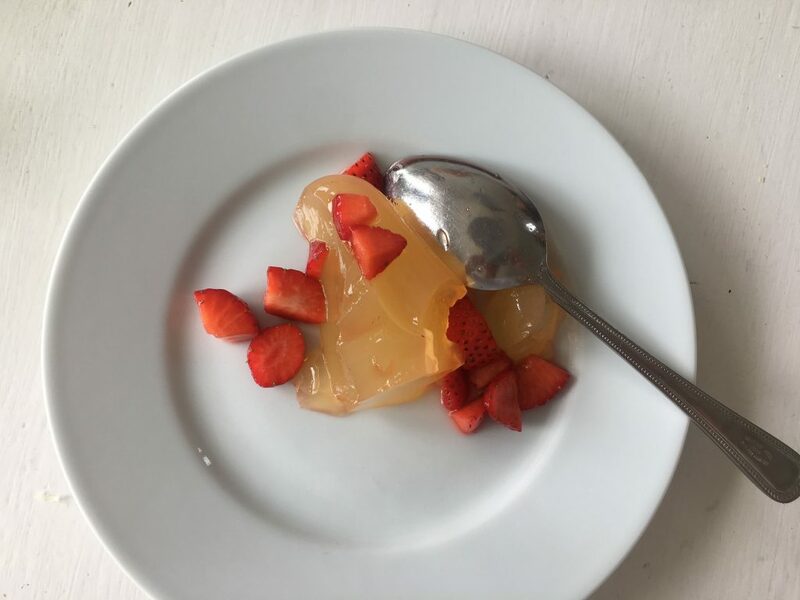 When the apple juice is hot add the squeezed out gelatine, mix well until it has melted then add to the cold apple and elderflower, stir and pour into a 1 litre jelly mould. Let it cool then put in the fridge until set, overnight is best. Sit the mould in hot water for a minute or two and then turn out. Serves 6 easily or more with something else alongside.